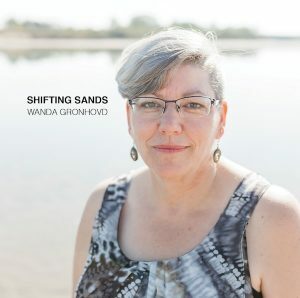 Shifting Sands CD from Wanda Gronhovd. Folk & adult contemporary. During these turbulent times of seemingly endless natural disasters, terrorist attacks, and political and social unrest, it’s a breath of fresh air to hear the comforting sounds of Wanda Gronhovd. Combining elements of folk, pop, and soul, she masterfully evokes the full spectrum of human emotion: love, loss, doubt, heartbreak, sorrow, hope, and strength. If you’re a fan of Sarah McLachlan, Joni Mitchell, Carly Simon, or Laura Marling then the music of Wanda Gronhovd will make your ears and heart happy. Gifted with a warm, yet powerful voice, Wanda Gronhovd released her well-received debut album Awakening in 2014. With the release of her new album Shifting Sands, it’s clear that she avoided the dreaded sophomore slump. Producer Brad Prosko at B-Rad Productions (Jess Moskaluke, Blake Berglund, Chris Henderson, Jeffery Straker) helped expand her sound, opting for a more upbeat, folky, singer/songwriter sound with just a hint of country. Shifting Sands is chock full of sonic gems. The album kicks off with the upbeat toe tapper “No More Words,” followed by the introspective “I Could Not Speak For Myself,” “Grief,” and “Oh Sister” which deal with harsh real-life issues like sickness, death, separation, and tumultuous life changes. While the first half deals with some heavy and uncomfortable aspects of life, the lyrical tone dramatically shifts for the remaining tunes. The title track, “Shifting Sands,” and “Uneven Footing” all deal with finding strength and empowerment after learning from and surviving the difficult times in life. Ultimately, it’s this sense of hope and optimism that lingers with the listener and makes Wanda Gronhovd’s latest album so rewarding. More about the Shifting Sands release. Wanda writes about the days before her cd launch.